The idea of an iPad orchestra is not something that most people think that an iPad can do. For most, the iPad is only seen as the source of games. @thecgiteamnz were asked by the Pukekohe Library to join them in celebrating the New Zealand Music Month of May. In 2001, the New Zealand Music Month was celebrated for the first time. Back then it was to raise the profile of Kiwi artists on the airwaves. Since then, it’s come a long way and now it’s grown into an amazing month-long celebration. The goal is now all about raising awareness of homegrown music. 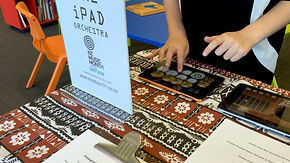 The CGI (Connecting Generations Innovatively) Team saw it as a great way to bring an iPad Orchestra to the community. The workshop was designed to give people a different experience around iPad. The Team took 6 iPad loaded with 3 different Free instrument apps to the Pukekohe Library. The CGI Team found that at least half of the children that came to visit the workshop already knew about the different instrument apps. They had also used them at school. Interestingly, all of the adults that attended thought that the iPad were only for games or apps that the school uses. They also thought that instruments were a lot of fun, easy to use and surprisingly did not sound electronic. With iPad Orchestra pioneers such as Hanah Al Attar – a music supervisor in the UAE who created the project ‘For a child’s smile’. This project replaced traditional instruments with iPad. It was the perfect solution for their school district for two reasons. One, there was a short supply of instruments and secondly, for children with special needs – it was much easier to use. They found that the iPad orchestra also built confidence, group work and concentration within the children. The CGI Team combined their love of #technology & #music to hopefully spark the idea that the iPad is much more than just playing games.